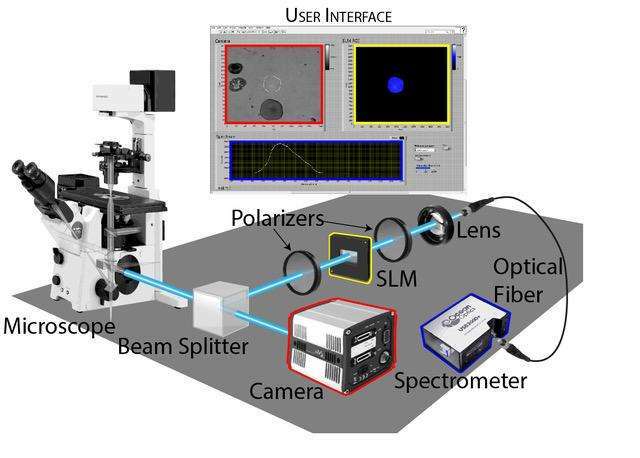 The group created a new tool as part of a lab class within the Biophysical Sciences graduate program at The University of Chicago, enabling its users to zero in on the spectrum from specific structures within samples. "The bulk of the work was done by graduate students during their first semester," said Adam Hammond, curriculum director and senior lecturer in the Biophysical Sciences program at the Gordon Center for Integrative Sciences. "Their enthusiasm and creativity made this project possible." As the group reports this week in the journal Review of Scientific Instruments, from AIP Publishing, the goal of their instrumentation is to observe the spectrum of light that comes from part of a sample on a microscope—but not the entire sample. "The value of a microscope is that it allows you to observe the variations within a sample," Hammond explained. "We wanted to be able to ask, 'what's the spectrum from that specific structure right there?' This isn't a new desire and instruments that can do it exist, but none, as far as I know, as simply as ours." During his first year in graduate school, Peter Dahlberg, first author of the article who is now at Stanford University in California, got to build a selective excitation microscope. "Subconsciously, I think the idea started then," he said. "Why not do the same thing, but in reverse?" How does the group's tool work? First, it splits the light that comes from a sample. Half goes to a camera for normal imaging and the other half goes to a spectrometer. But before it gets to the spectrometer, that half passes through a few optical components that allow users to choose any arbitrary portion of the image and block everything else out. "There's nothing tricky about these optical components—a spatial light modulator (SLM) between crossed polarizers," Hammond said. "SLMs are common now, with at least three in many modern digital projectors. They have an array of pixels that can each manipulate the phase of the light that passes through them." Although there are several tricks you can do with a SLM, the group is using the most straightforward one. "We focus the image from the sample onto the SLM and shift the phase of only those pixels that we want to obtain a spectrum from," he continued. "The shifted light passes through a second polarizer; everything else gets blocked out. Then that light is collected and can be sent to any kind of optical instrument you choose. Right now we send it to a small UV/Vis spectrometer to get a full spectrum." The group's instrument is, perhaps, best summed up as a "workhorse tool." Its simple concepts and components can easily be adapted for many different purposes and added to existing microscopes easily and inexpensively. "We set out to build it for one specific use: To measure the spectral shift of fluorescent indicators," Hammond said. "We didn't really think about making it versatile or how to arrange the SLM and polarizers when we started. But we had an enjoyable series of realizations along the way." One such realization was that their instrument could also be used for absorbance measurements. "Often, the most important samples are tiny and hard to create or purify—like crystal forms," he said. "It's arduous work to purify the two types away from each other in sufficient quantities to fill a cuvette. When you put the mixture on a microscope slide, it gets easier. Crystals can be measured one at a time, and so can cells that express variable chromophores (molecules responsible for color). This opens up a whole new area that wasn't part of our original plan." The group's instrument can "take the full spectrum of one or more user-defined regions of interest while simultaneously capturing standard fluorescence images of the whole field of view," Hammond said. "So what you can do with it depends on the sample. We're using it now to follow fluorescent probes for pH and calcium. But an example of a very different application is its ability to identify individual microorganisms within a mixed sample by their absorbance fingerprint." What's next for the researchers? "By using a pulsed excitation source, the fluorescence lifetime of a probe could be measured from a select region of interest," said Hammond. "One interesting potential application is within the field of neuroscience for resolving single action potentials with dyes that are sensitive to membrane potential. Fluorescence lifetime measurements provide an advantage over direct fluorescence measurements because they're independent of the concentration of the probe."